Madness and Civilization: A History of Insanity in the Age of Reason, by Michel Foucault, is an examination of the ideas, practices, institutions, art and literature relating to madness in Western history. It is the abridged English edition of Histoire de la folie à l'âge classique, originally published in 1961 under the title Folie et déraison. Histoire de la folie à l'âge classique. A full translation titled The History of Madness was published by Routledge in June 2006. Foucault begins his history in the Middle Ages, noting the social and physical exclusion of lepers. He argues that with the gradual disappearance of leprosy, madness came to occupy this excluded position. 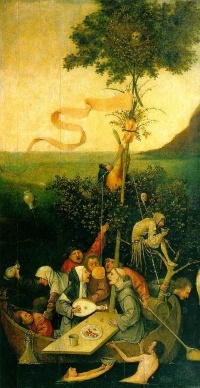 The ship of fools in the 15th century is a literary version of one such exclusionary practice, the practice of sending mad people away in ships. However, during the Renaissance, madness was regarded as an all-abundant phenomenon because humans could not come close to the Reason of God. As Cervantes' Don Quixote, all humans are weak to desires and dissimulation. Therefore, the insane, understood as those who has come too close to God's Reason, were accepted in the middle of society. It is not before the 17th century, in a movement which Foucault famously describes as the Great Confinement, that "unreasonable" members of the population systematically were locked away and institutionalised. In the 18th century, madness came to be seen as the obverse of Reason, that is, as having lost what made them human and become animal-like and therefore treated as such. It is not before 19th century that madness was regarded as a mental illness that should be cured, e.g. Philippe Pinel, Freud. Others authors later argued that the large increase in confinement did not happen in 17th but in the 19th century, somewhat undermining Foucault's argument. Foucault also argues that madness during the Renaissance had the power to signify the limits of social order and to point to a deeper truth. This was silenced by the Reason of the Enlightenment. He also examines the rise of modern scientific and "humanitarian" treatments of the insane, notably at the hands of Philippe Pinel and Samuel Tuke. He claims that these modern treatments were in fact no less controlling than previous methods. Tuke's country retreat for the mad consisted of punishing them until they gave up their commitment to madness. Similarly, Pinel's treatment of the mad amounted to an extended aversion therapy, including such treatments as freezing showers and the use of straitjackets. In Foucault's view, this treatment amounted to repeated brutality until the pattern of judgment and punishment was internalized by the patient. Although Madness and Civilization has widely been read as a criticism of psychiatry, and often quoted in the anti-psychiatric movement, Foucault himself criticized, especially in retrospect, the "Romanticism of Madness", which tended to see madness as a form of genius which modern medicine represses. He did not contest the reality of psychiatric disorders, as some of his readers have concluded. Rather, he explored how "madness" could be constituted as an object of knowledge on the one hand, and, on the other hand, as the target of intervention for a specific type of power: the disciplinary institution of the asylum. Unless indicated otherwise, the text in this article is either based on Wikipedia article "Madness and Civilization" or another language Wikipedia page thereof used under the terms of the GNU Free Documentation License; or on original research by Jahsonic and friends. See Art and Popular Culture's copyright notice. This page was last modified 09:47, 25 March 2018.